Only elders with black berries are grown for their fruit. The red-fruited kinds are inedible. Soil and situation The elder is tolerant of a wide variety of soils, including those with bad drainage, and a wide range of soil pH. It is lime-tolerant. The elder will grow in most situations but it fruits most freely in a sunny position. Common elder is hardy to zone 6; S. canadensis in zone 3. Planting The elder may be grown as a standard on a single stem but it is more usually grown as a large rounded bush with a number of branches from near ground level. Plant a one- or two-year-old tree in early spring. Four weeks before planting prepare the ground, clearing away perennial weeds over an area 3 ft square. Fork in a balanced fertilizer, such as a brand of 10-10-10 at a rate of 3 oz per square yard. Dig a hole wide and deep enough to take the roots fully extended. For standards, drive in a stake to reach just below the lowest branches. Place the plant in the hole at the same depth as at the nursery and then fill in the soil gradually, firming it at the same time. Tie the standard to the stake with a tree tie and cushion. The bush does not need staking. The American elder is not self-compatible. For cross-pollination to occur there should be a minimum of two varieties, planted about 10ft apart. 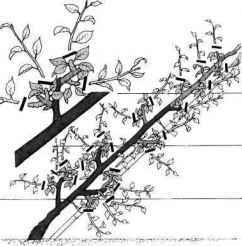 Pruning After planting, cut out weak and damaged growth and cut back main shoots by a few inches to a good, outward-facing bud. This ensures that during the first growing season the plant's energy is concentrated on producing a strong basic framework of branches. Cut back any unwanted suckers to ground level. Little flower is produced in the first year. In subsequent years, in late winter, cut out dead and congested branches to maintain a good shape. Cut out about a quarter of the old wood back to base each year to encourage new growth. Cut back unwanted suckers to ground level and protect the cuts with a wound paint. Feeding In dry spring and summer weather water well and mulch the root area with well-rotted manure or compost. If growth is weak or slow, feed with a balanced fertilizer at a rate of 2 oz per square yard. A 5-20-10 balanced fertilizer or ammonium nitrate can be applied each spring. Ammonium nitrate may be applied at 1 oz per year of shrub age up to a maximum of 16 oz, and 5-20-10 fertilizer at 16oz per year up to a maximum of 64 oz.